BORDELON: Actually, I may have nailed down Rosalie Bordeon's parents: Louis L. Bordelon and Aimee (Marie) Mayeux. Ancestry.com had a wealth of pedigree backwards from them. Scores of French names. Joseph Nesbitt Perot (1880-1912, b. Lake End, La., d. El Paso, Tx. Irene Elizabeth Perot (8/25/1882-1969, b. Lake End, La., d. Lawton, Ok.
Lillian Rose Perot (3/29/1886-?, b. Lake End, La. Mary Julia Perot (11/15/1888-6/12/1963, b. Lake End, La., d. Shreveport, La. Teresa Perot (d. 9/1891) - Perhaps Eugenia's twin who died at 2 months of age. 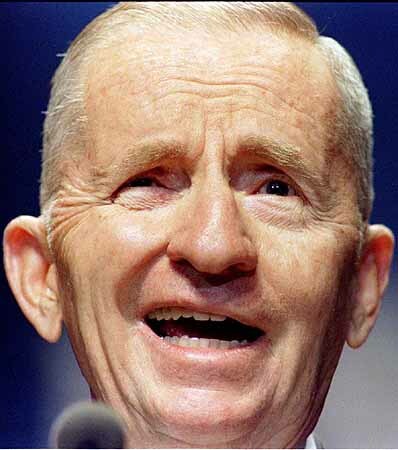 Getting back to the famous H. Ross Perot. He was born on June 27, 1930, to Gabriel Elias (Ross) Perot and Lulu May Ray. Gabriel, or "Big Ross" as he was known even though he was only about 5 feet tall, moved to Texarkana from Louisiana and made his fortune in cotton. Gabriel was probably born around 1900 in Louisiana. I still haven't found him yet, but I did find that name in the 1860 Natchitoches census. That Gabriel was the 8-year-old son of Omar, 40, and Mary E. (30) Perot. Omar was also a "planter," worth $1,600 and $10,038. Evidently, some Perots turned their cotton planting business into fortunes and some didn't. H. Ross Perot's branch did, and it appears my Perot branch didn't. H. Ross Perot's paternal ancestry traces back to a French-Canadian immigrant to Louisiana in the 1740s. His full name was Pierre Joseph Francois Barthelemy Vildec dit Perot. Many French used what are called "dit names," which denoted an alias or nickname by which a person was known. The Vildec and Perot names were used interchangeably in early records, but Vildec was the original name. Perot's immigrant Perot ancestor has French lineage that has been traced back to the 1500s, according to Elizabeth Shown Mills, of Tuscaloosa, Ala., a certified genealogist and fellow of the American Society of Genealogists. Pierre Joseph Francois Barthelemy Vildec dit Perot married Marie Catharine DuPre in Louisiana in 1748. Marie's father was French, and her mother was German. "The Perot line has some branches that became prosperous, others not--Ross is from the prosperous line that moved into Texas after the Civil War, settling in Texarkana," she said. Another ancestor was Louis Juchereau de St Denis, a major figure among the founders of the colony of Louisiana. According to the Handbook of Texas, he founded Fort St. Jean Baptiste, present day Natchitoches, the first permanent settlement in Louisiana. A frontier commandant, lieutenant governor and Chevalier of the Royal Order of St Louis, he was famed for his diplomacy among the Native Americans, for the tribal tattoos he wore and for his elopement with the daughter of a Spanish official who was being held under house arrest in Spanish Mexico.